There is something primal about the feeling one gets when they look out at the ocean. It’s the great expanse of the unknown that inspires profound curiosity. While the sea fascinates us, it also humbles and reminds us just how small we are. This beautiful and terrifying build by Ralph Langer is a snapshot of that reminder. 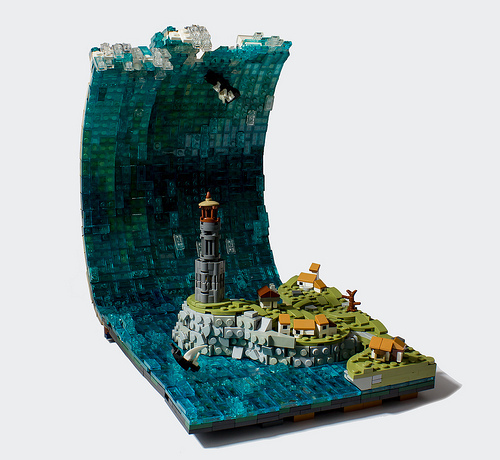 Built with lots of hinged parts, this tsunami swell perfectly captures the moment before disaster strikes. Just imagine how ominous it would look photographed against a dark backdrop! We cringe at the thought of being the people in that ship at the wave’s crest. But let’s not forget how awesome the little microscale lighthouse and village are! It’s a perfectly crafted landscape and a clever use of parts!